Addressing the challenges of climate change will be a central issue during the G20 meeting taking place on 7 and 8 July in Hamburg, northern Germany. This was the guarantee given by the host Angela Merkel, who has been leading the fight against global warming after the US withdrawal from the Paris agreement. Also, the new French president, Emmanuel Macron, and even the Chinese leader, Xi Jinping have been heralded as leading the fight against climatic change, bearing in mind the scepticism coming from the White House. Nevertheless, much talk from these countries about their commitment to global warming is no more than simple rhetoric. A study released this week titled „How G20 Governments are financing Climate Disaster“, has revealed how these countries spend 4 times more on fossil fuel projects than on renewable energy. Such investment takes place in the form of soft loans, guarantees from governments and even fossil fuel subsidies. Overall, the G20 contributed $71.8bn of public finance to fossil fuel projects between 2013-15, whilst only $18.7bn for renewable energy. This data shows that these countries, who should be leading the transition to clean energy (critical to keeping temperature rises below 2˚C), are failing to do so. The European Union itself, which prioritises the use of renewable energy in its legislation, shows its contradictions by allowing oil and gas exploration through fracking in countries such as Poland. Although the EU’s dominant countries Germany and France aim to distance themselves from the climate change-denying Trump administration, they also protect the environmentally-damaging practices of private companies rather than tightening environmental controls. 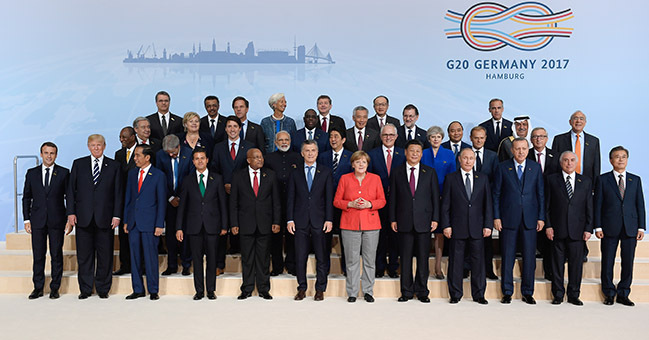 Such hypocrisy displayed by the G20 counties has fuelled public outrage which will be displayed in demonstrations expected in Hamburg over the next few days, threatening to disturb the upcoming meetings and highlight the questionable policies outlined by various G20 governments.